The day had finally arrived; we landed in Japan, the tenth and final country on our six-month journey. It was hard to believe that our world tour was finally coming to an end, but we were excited to live up our last 10 days in three different Japanese cities hopefully getting a good taste (literally) of the country. Our first stop in Japan was Osaka, a port city on the Japanese island of Honshu known for it’s modern architecture, bright nightlife and amazing selection of street food. We’d been told that Osaka was like a smaller version of Tokyo, but after visiting Tokyo we’d say that it had its own distinct personality. We arrived late in the afternoon after a short flight from Seoul and made our way straight to the tourist center of town for Osaka’s most famous street food, okonomiyaki, a Japanese savory pancake containing a variety of ingredients. I’d heard rave reviews of a reasonably priced restaurant called Mizuno, which exclusively serves okonomiyaki hibachi-style and you’re able to watch the chefs make your pancake every step of the way. We ended up choosing one with an egg and a lot of different vegetables and another one with seafood. They were both served with some amazing sauces on top and sprinkled with aonori (seaweed flakes). Both were super tasty and very generous sized portions. Afterwards we wandered around the Dotonbori area, which was filled with tons of shops and restaurants many with larger than life 3D signs hanging off the top of the buildings advertising what they were. 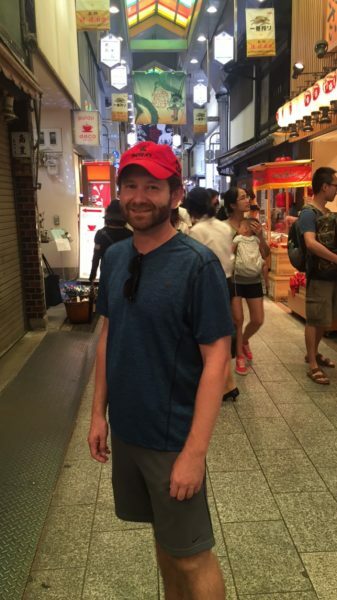 I also dragged Jeremy to this cool little section of town called Sennichimae Doguyasuji filled with dozens upon dozens of shops selling all types of items that are found in a Japanese kitchen or restaurant. I was super tempted to spend our entire budget for the day on a real Japanese chef knife but resisted. 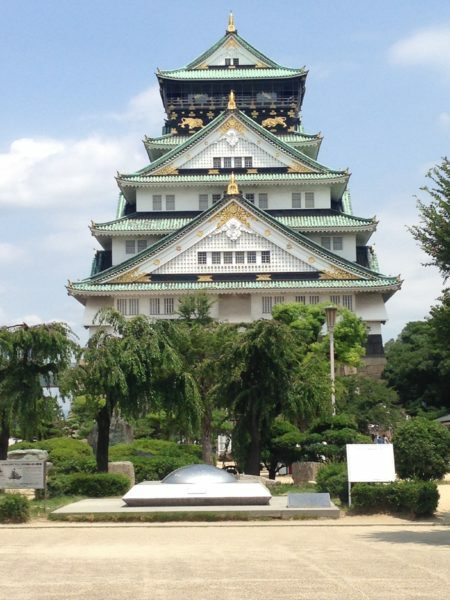 The next morning we headed out to explore the famous Osaka Castle, our first castle in Japan! It’s one of Japan’s most famous landmarks and it played a major role in the unification of Japan during the sixteenth century of the Azuchi-Momoyama period. In 1997 it was converted into a museum and we climbed through eight-floors of Japanese history. Something we’ve found interesting in all our travels is how affordable castles, temples, and historic sights are in Asia compared to the cost of similar museums and sights in Europe and the U.S. Most are priced between $4-15 a person, which has really allowed us to explore many different historical places we originally thought we wouldn’t be able to afford. After exploring the castle we wandered through the huge park grounds and ended up at another entrance, which happened to be right on the subway line we were looking to take to our next stop, the Shitennoji Temple. I was super excited to learn during my Osaka research that on the day we’d be visiting Shitennoji there was a huge Japanese flea market set-up on the grounds with a ton of cool antiques. Shitennoji is Japan's first full-fledged Buddhist temple, constructed 1,400 years ago and was free to explore the grounds and visit the ground floor of the five-story pagoda. Afterwards we wandered to another touristy area of Osaka called Shinsekai which I imagine has a happening night scene but since we were there around 4:00pm it was a little bit dead. For dinner that night we visited a restaurant known to be the originator of conveyor belt sushi called Genrokuzushi Sennichimae. This place had super fresh fish and the best part was that every plate, including fatty tuna and uni was only $1.25 per piece! I also loved that the façade of the restaurant had a giant hand holding an enormous piece of tuna sashimi! The next morning we took our first trip on a Japanese train to the beautiful city of Kyoto only 45 minutes away. Kyoto is known for their countless shrines, temples, and Japanese gardens along with several opportunities to enjoy Japan’s nature. In March when the cherry blossoms bloom it’s supposed to be one of the most photogenic cities in the whole world. 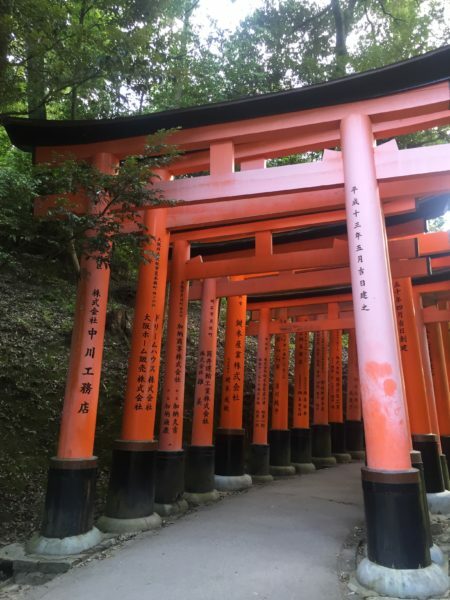 After dropping off our bags in Kyoto at our little Air BnB studio apartment, we made our way to the Fushimi Inari Taisha shrine, a famous landmark I’d seen in photos and had been looking forward to visiting for months. It is famous for its thousands of bright red torii gates, which straddle a network of trails behind its main buildings. The trails lead into the wooded forest of the sacred Mount Inari, which stands at 233 meters and belongs to the shrine grounds. The beginning part of the trails were packed with people looking for the perfect photo, but we found that the further we got away from the main shrine there were much better opportunities for beautiful pictures. 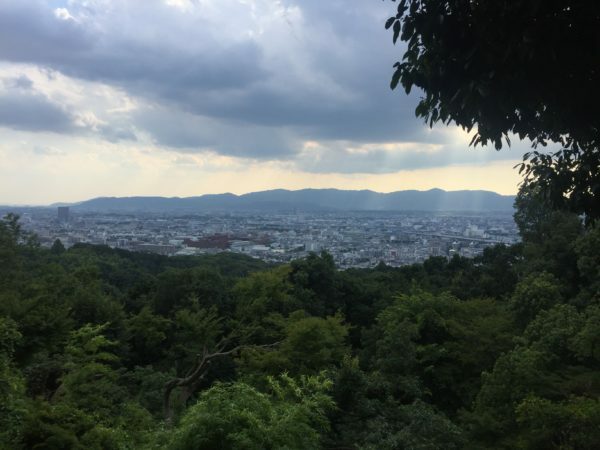 Even better, there were some amazing views of Kyoto the further you go up the mountain. Afterwards we headed to the Yasaka Shrine, which is located in the Gion area of Kyoto. 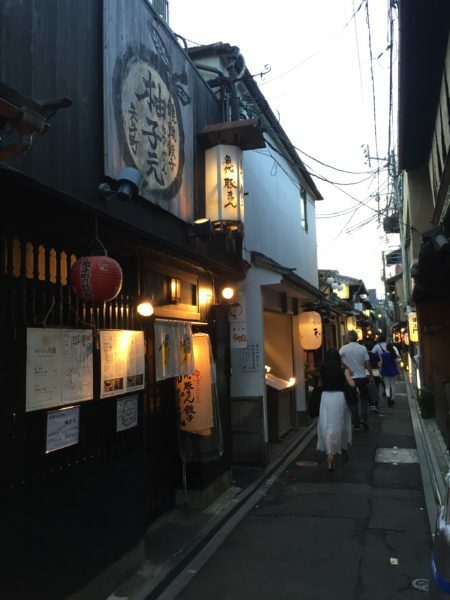 Gion is a popular nightlife area filled with a lot of different shops and restaurants. The Yasaka Shrine is a Shinto Shrine and includes several buildings, gates, a main hall and a stage. Surrounding the shrine are several acres of peaceful gardens and we happened across a man playing some traditional Japanese music on his flute. Sitting in the beautiful gardens, listening to the music and just taking in the atmosphere was the perfect end to a busy day of travel and touring. From Yasaka we walked through Gion filled with a bunch of cute little alleyways lined with izakayas easily identified by their red lamp lit up outside the shop. I loved exploring this area, which seemed like an interesting mix of ancient and modern city all at once. We also came across a real geisha, which I got super excited about since they are very rarely seen. I wish I had taken a photo, but that can sometimes be disrespectful so we just observed her walking gracefully to her job for the evening. Despite what a lot of people think, geisha are not ladies of the night, but are traditional Japanese female entertainers who act as hostesses and whose skills include performing various arts such as classical music, dance, games and conversation. The next morning, we made our way to the beginning of the Philosopher’s Path starting at Ginkakuji, a Zen temple along Kyoto's eastern mountains. Ginkakuji consists of the Silver Pavilion, half a dozen other temple buildings, a beautiful moss garden and a unique dry sand garden. For a small fee we explored the circular path around the grounds getting a glimpse at some bonsai trees, small ponds and immersing ourselves in Japanese nature. After leaving we began our hour-long stroll on a pedestrian path alongside a small canal that passed several different shrines as well as some traditional Japanese homes. The path is so named because it’s rumored that a Kyoto University professor Nishida Kitaro is thought to have used it for daily meditation. In the afternoon we made our way outside the city to visit the famous Arashiyama Bamboo Grove. One of the most famous sites in Kyoto, the bamboo grove is unlike any other forest I’ve visited before. Thousands of bamboo stalks line the pathways with light filtering through the skinny trees providing a backdrop for some amazing photos. Our last day in Kyoto coincided with the last day of the Gion Matsuri or Gion Festival. This meant that a parade with traditional yama and hoko floats came right down the street we were staying off of. Some of the floats were up to 25 meters tall and weighed up to 12 tons. The festival dates back to 869 as a religious ceremony to appease the gods during the outbreak of an epidemic. Even today, the festival continues the practice of selecting a local boy to be a divine messenger. 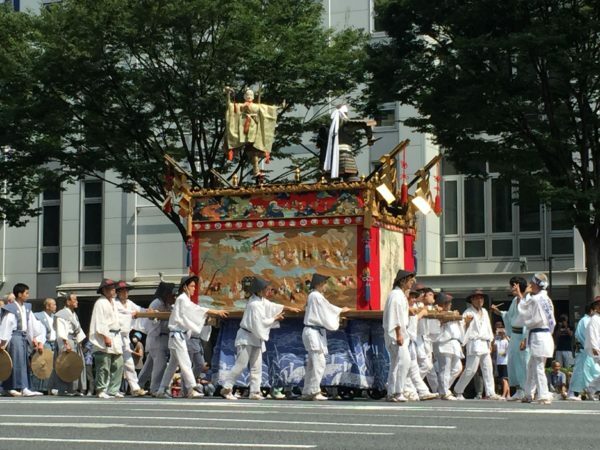 It was a spectacular sight to behold, sometimes up to 100 people in traditional Japanese dress would be leading the wheeled floats pulling them on ropes. After the parade we made our way to Kyoto Imperial Palace Park to tour the grounds even though the palace itself was closed. We wound our way around, observing families enjoying a Sunday picnic and children playing in a nearby stream. Our next stop was the Nishiki Market, which was filled with dozens of food stalls selling all sorts of Japanese delicacies from sushi to ramen and much more. The market was also connected to a series of covered pedestrian walkways lined with storefronts and packed with locals and tourists doing some shopping. We finished our touring for the day at the most serene and beautiful Japanese garden we have seen. 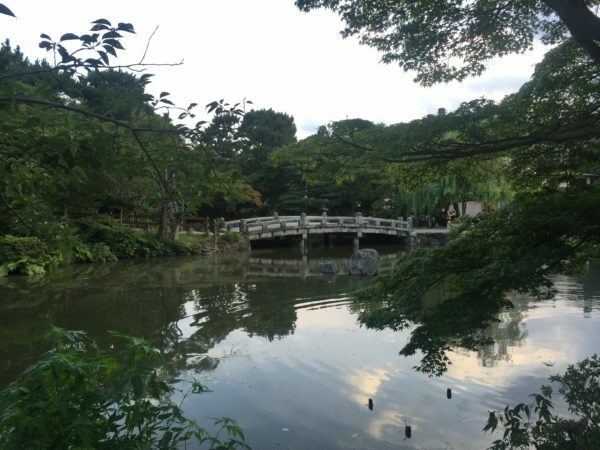 Connected to the Heian Jingu Temple, Heian is actually the former name of Kyoto, and the shrine dates back to 1895. It was built for the 1,100th anniversary of the capital’s foundation in Kyoto. Behind the shrine you could find beautiful gardens filled with weeping cherry trees, a variety of Japanese plants, ponds and traditional buildings making for one of the most photogenic spots we’d found in Kyoto. We couldn’t have been happier with the two very different cities we’d picked to visit so far in Japan. Osaka was the perfect high energy start with its over the top storefronts and bright lights. 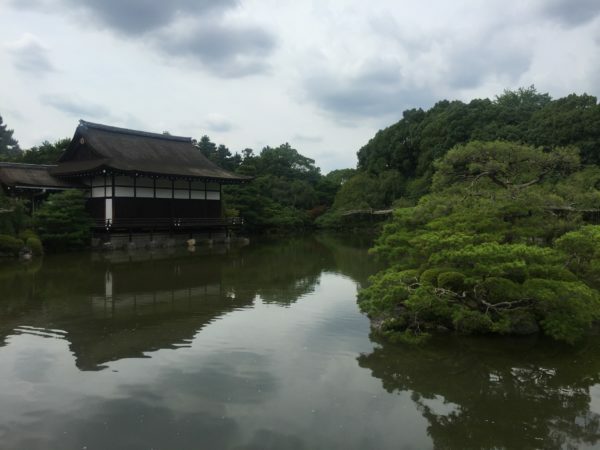 Kyoto was exactly how I imagined it would be with its beautiful gardens, temples and shrines and a peek into the past of ancient Japan. After five days between the two of them we were ready for our final city of the trip, Tokyo.